Are you wondering how you can increase and optimize your company resource utilization? 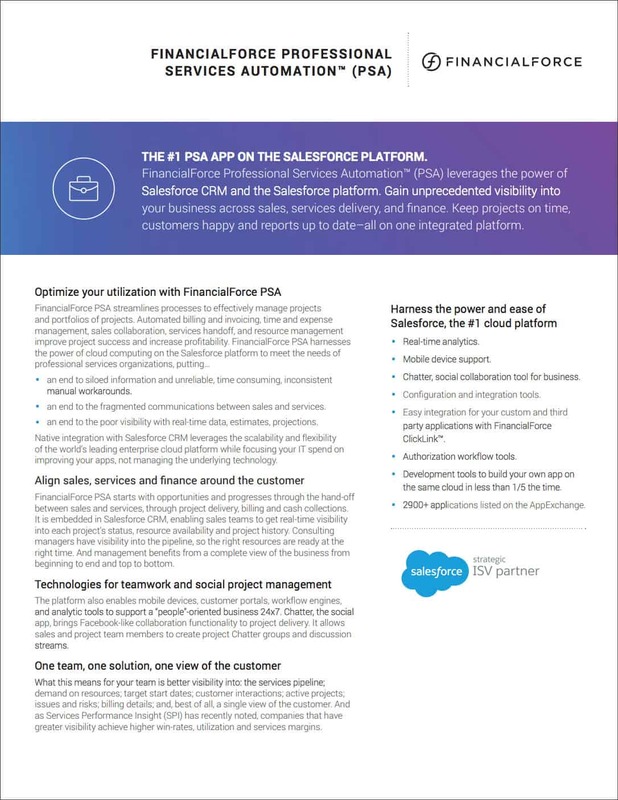 FinancialForce Professional Services Automation (PSA), helps organizations streamline and automate all of your business processes including: invoicing, billing, time and expense management, services handoff, sales collaboration, resource management and much more. Service Performance Insight (SPI), the industry standard for Professional Services benchmarking, surveyed over 500 professional services organizations across the globe and found that those utilizing a commercial PSA solution delivered on average 4% higher utilization than those that don’t. FinancialForce PSA is the leading enterprise services solution, offering you scalability and flexibility. Get real-time visibility into each of your project's status, resource availability, and project history - all on a single platform, Salesforce. Learn how you can increase your company's resource utilization, download the PSA datasheet for more information.